Bekijk Dubrovnik vanaf de zee en leer hoe je kunt kajakken tijdens deze tour van een halve dag. Begeleid door een gids, peddel rond het offshore-eiland Lokrum en hoor verhalen over de geschiedenis van Dubrovnik. Bezoek de Betina-grot en pauzeer voor een ontspannen zwemmen en snorkelen met de meegeleverde uitrusting. Kies voor klifduiken en neem een ​​pauze voor snacks. Highly recommend spending time on the water off the shore of Dubrovnik. Our guide, Marta, was top notch.....We got quite a work out, swam in the beautiful Mediterranean, had a snack and learned about Dubrovnik, past and present. The entire crew at x-Adventure was helpful and accommodating. My friend and I were in Dubrovnik and had heard excellent things about kayaking on the Adriatic Sea, and we were not disappointed. This was a truly great experience with stunning scenery. We had a blast and even got the new experience of tandem kayaking with sit-on kayaks which made for even more fun learning to do it together. 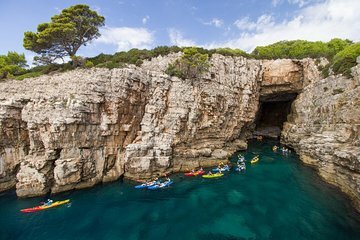 This tour went above and beyond what we were expecting - we stopped at two different caves and were able to go snorkeling and cliff diving on top of 8km of paddling. What was more was that our guide, Eddie, really elevated this experience for us. His knowledge, patience, and humour really added to the day. We would both 100% recommend taking this tour if you find yourself in Dubrovnik.